One of the hundreds of famous French Bulldog I follow on Instagram, okay!!! Human influencers are just way too much trouble than they’re worth. They scam followers, they promote harmful products like detox teas and appetite suppressing lollipops, and they have a tendency to blurt out racist, insensitive bigotry that can crumble their brand and any other associated with it. 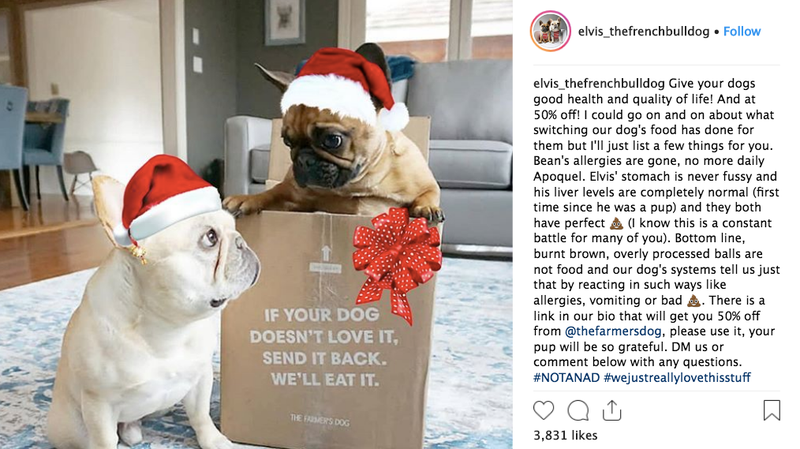 Edwards manages some dogs who have 2 million followers and those that have more in the tens of thousands, with a client list that has included Dyson, the Ritz Carlton, and Ralph Lauren. The Dog Agency then comes in to make sure pets are really using their influencing potential because lord knows it’s not going to last forever. “These humans a lot of times have full-time jobs, they’re not checking their dog’s email regularly,” Edwards says. And as someone who follows a lot of Instagram famous dogs, I can personally attest to how jarring it is to see a dog promoting a product made specifically for humans. I can remember at least one recent post of a dog with a set of nice (human) earbuds sort of lazily drooped around its ears and neck. But there is also a booming market for fancy dog stuff, like apparel and treats. In 2017, Americans spent $70 billion on their pets, and the market for dog food, clothing, toys, etc. has been expanding for years. One of the arguments for why people are so pet-crazy right now especially among younger generations is that people are delaying have kids or not having them at all. So people are treating their pets like their children and showering them with the sort of luxuries (and photo shoots) you might give a human baby. And that’s how you get pet influencers, who are guaranteed to never sell you appetite suppressing lollipops.